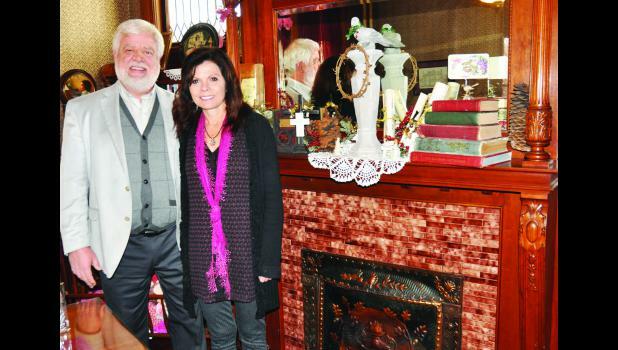 Dennis and Joni White’s historic home will mark its 115th Christmas this year, and northeast Kansans are invited to tour the White residence in Holton this Saturday during the “I’ll Be Home For Christmas” homes tour. The homes tour is scheduled for 10 a.m. to 3 p.m. on Saturday, and the Whites are eager to show off their home’s charm and character. The home was built in 1899 at a cost of $25,000, Dennis said. It was built for A.D. Walker and his family. Walker also built Hotel Josephine, which was named after his daughter. The couple has lived in the home for 21 years. The home has four fireplaces and hot water registers with unique and individual designs that were hand painted, such as one adorned with cherubs. Dennis noted that students from Holton’s former Campbell College would take up rooms in the basement of the home. The Walkers had servants, and the house still has the original butler’s box in the kitchen that would indicate were service was needed in the home. “At the head of the dinning room table there was a button on the floor that you could push and they would come, and there were also buttons in the nursery and at the front door,” Dennis said. Renovations have been made to the home by the Whites and previous owners, which include installing central air conditioning and remodeling the maid’s quarters into a bathroom. The day after Thanksgiving, the Whites head to Hinson’s Tree farm south of town to pick out their family tree. The couple has two children, Kennedy, who is a junior at Washburn University; and Nanci, who is married to Jacob Kennedy. Nanci and Jacob have a daughter, Stella. “Our daughter and her family now meet us out there every year so they can pick out their tree,” Joni said. Among the decorations they pull out each year is a nativity scene that Dennis bought when he was a little boy. “He bought it with his own money on an after-Christmas sale,” Joni said. The couple also displays a small silver tree that used to belong to Joni’s grandmother, Stella. Most of the couple’s Christmas decorations are antiques or older items. A large Santa, which was a display from a former drug store on the east side of the Square, is perched in the White’s attic window. The couple also displays wall hangings quilted by Joni’s mother. The couple celebrates Christmas on Christmas Eve with a family dinner of lasagna and then a candlelight service at Holton Evangel United Methodist Church. They have a breakfast casserole Christmas morning followed by a family lunch. Dennis owns White Law Office on the north side of the Holton Square, and Joni teaches English at Holton High School and is a real estate agent with United Country Pagel. Sponsored by the Holton/Jackson County Chamber of Commerce and in part by the Jackson County Tourism Council, the “I’ll Be Home For Christmas” homes tour include homes owned by the Whites, Brooks and Tonya Barta, Les and Rosemary Wilkersons, Phillip and Ginger Lloyd and Brady and Brooke Black.